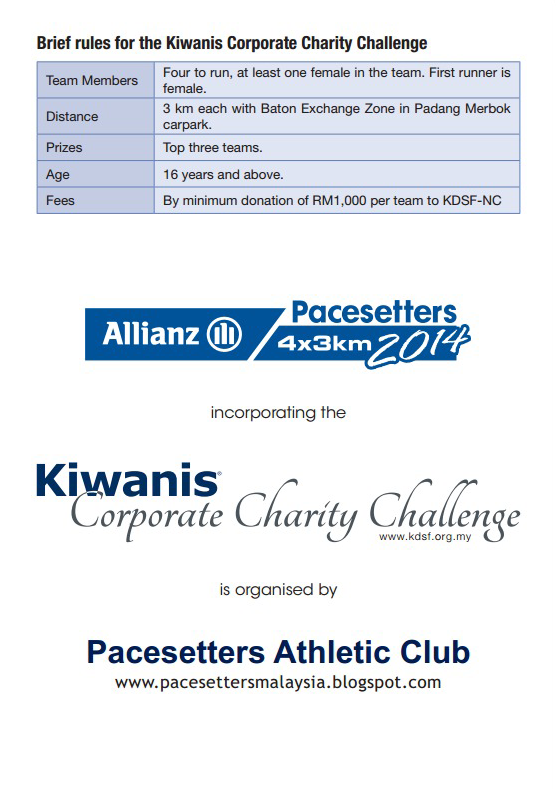 The Allianz Pacesetters 4 x 3km will be held on 14th December 2014 at Padang Merbuk Carpark. 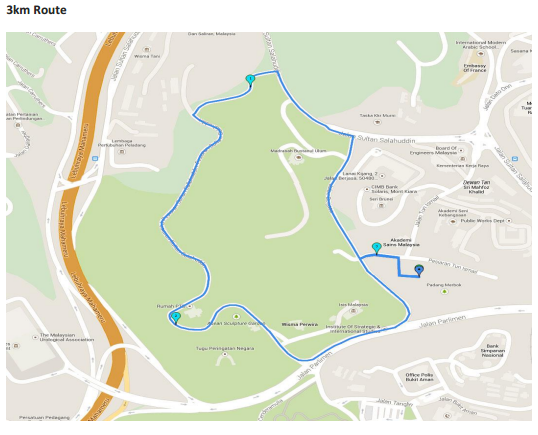 We expect a total of 250 teams to take part in this relay event. The club has a strong tradition of forming several strong teams for this event and this year being our 30th Anniversary, we would like to round up the year with a strong performance by our racing teams. The event will be opened for registration soon. The club will sponsor a total of 10 teams (5 Men Open and 5 Women Open teams). 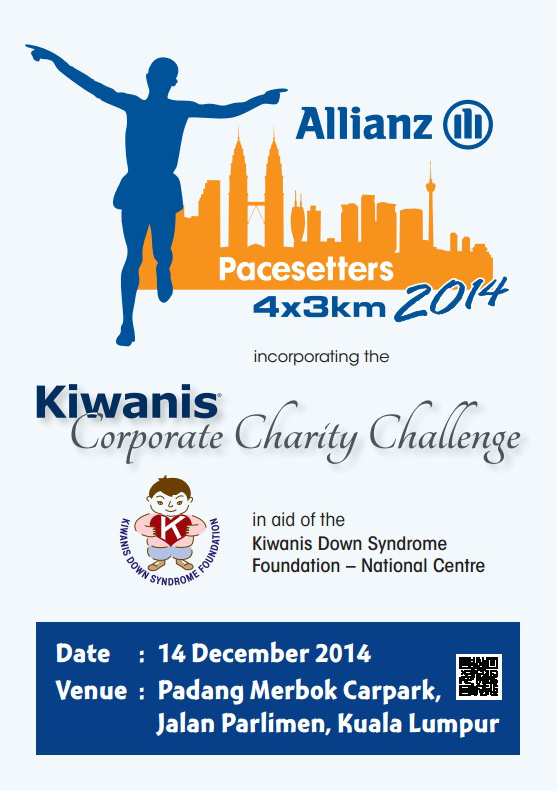 If there are strong under 26 aged runners, we will be happy to sponsor them too. 26th Oct - (Sunday) MPSJ Stadium, Subang Jaya at 4pm. 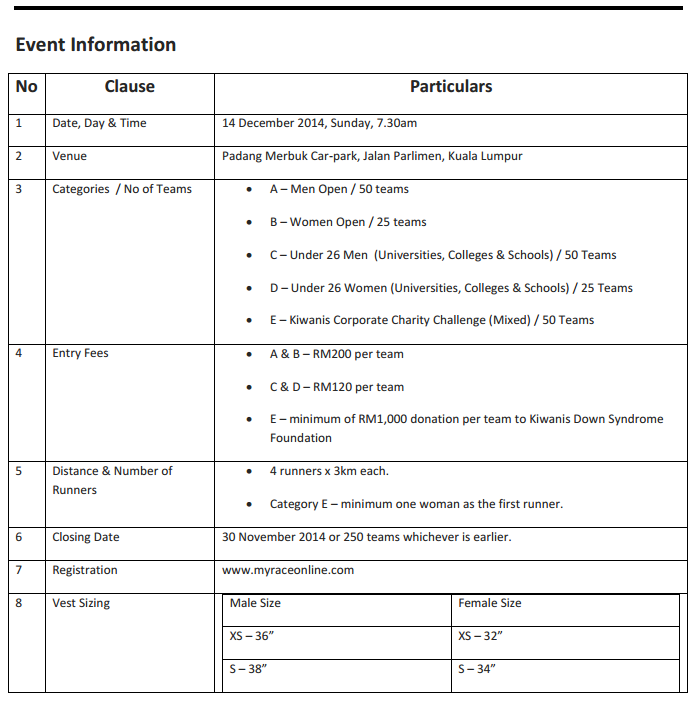 9th Nov - (Sunday) MPSJ Stadium, Subang Jaya at 4pm. 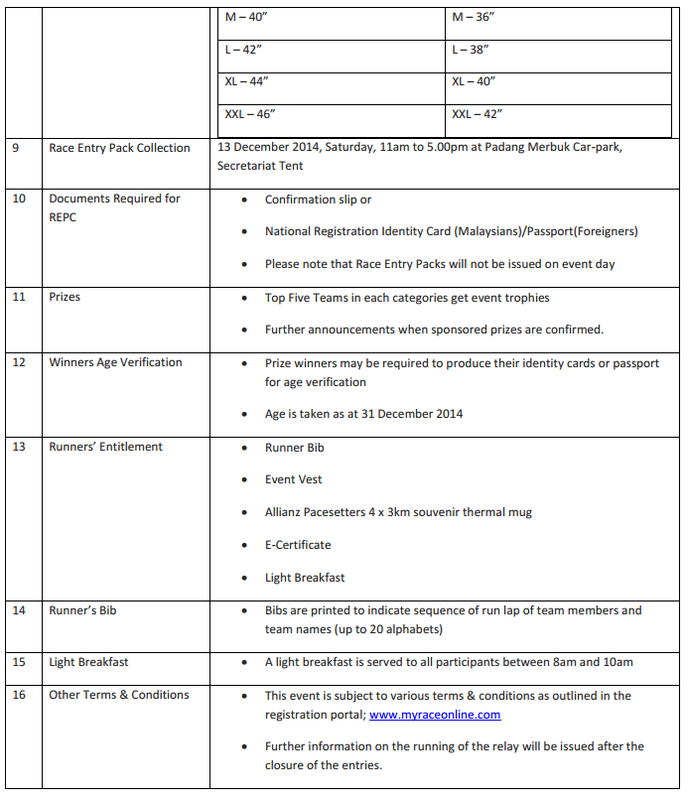 23rd Nov - (Sunday) MPSJ Stadium, Subang Jaya at 4pm. We need a few volunteers to help on time recording etc. Please contact the respective leaders as per above. 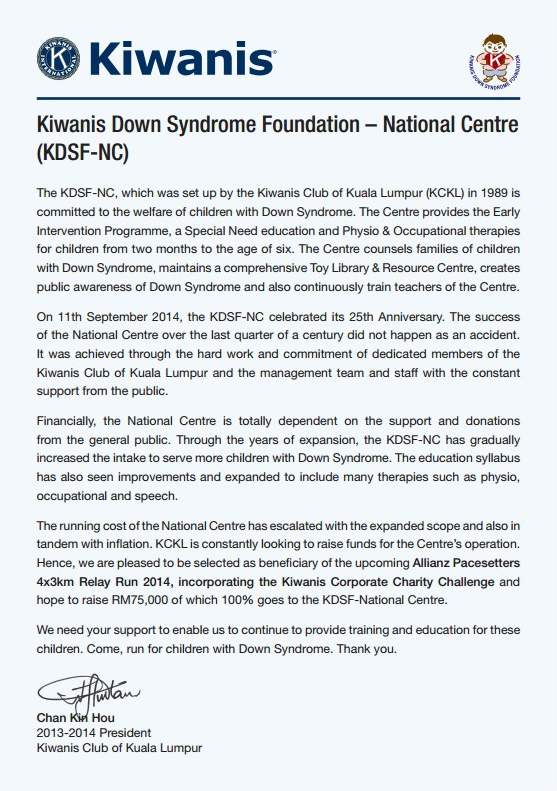 The club is also working with Kiwanis to raise funds for their Kiwanis Down Syndrome Foundation. Hi, can I double check that there's no more allowance for mixed-team? This has to be a full men team or full women team only? It's a shame if it's like that because last year we had a family team (dad mom son and daughter) and even my team has one female. Is there a possibility for exception? Thank you. I am afraid there is no standard mixed category. 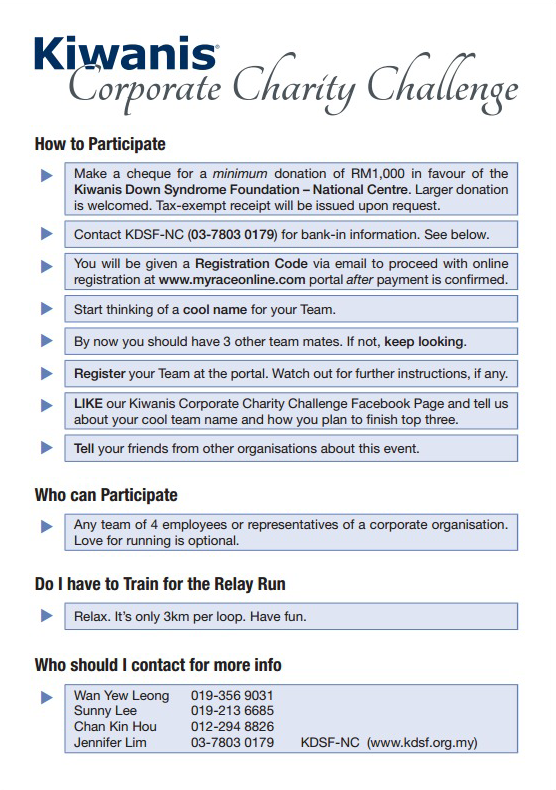 We only have the Kiwanis Corporate Charity Challenge, where requirement is minimum one female in a team, but it costs RM1,000 per team.